The Pacwest Builders Ghost Tree Invitational is back for year number fourteen. 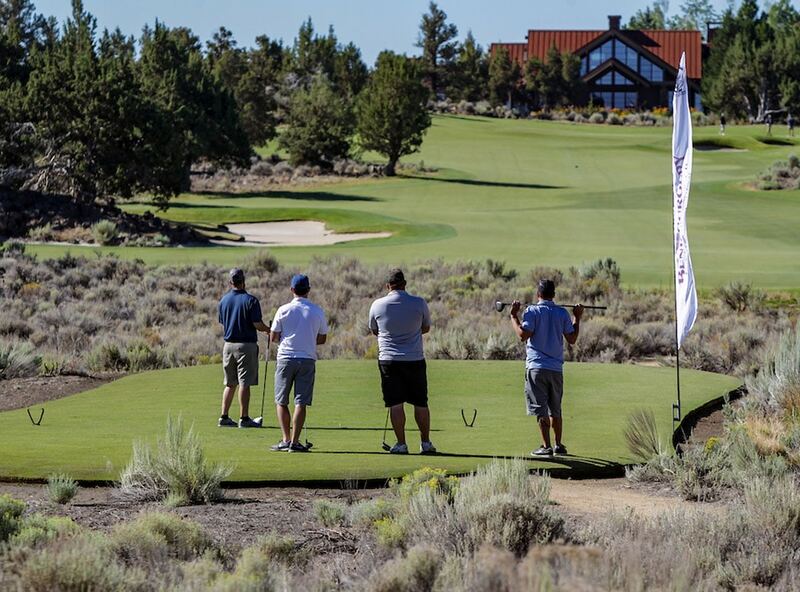 The Pacwest Builders Ghost Tree Invitational is a two day event taking place August 9th & 10th, 2019 at Pronghorn Resort in Bend, Oregon. Some people get confused and think they have to play golf in order to attend the Dinner on the Range Saturday night. That is simply not true, Friday and Saturday are connected, but a consumer can choose to do one or the other or both. So if you play golf or have never hit the links and have no interest in golf but just love to party and enjoy some of the finest cuisine in the region, then we’ve got the right event for you. Something for everyone! The event kicks off on Friday August 9th, 2019 with a double shotgun golf tournament at Pronghorn Resort in Bend, Oregon. Choose between an AM or PM shotgun time and put your foursome together to challenge up to 60 other foursomes. On Saturday August 10th, 2019 beginning at 5pm at Pronghorn Resort’s event lawn/range, guests will be allowed to enter a culinary and beverage heaven. Once inside their ticket gets them unlimited food and beverage throughout the evening. Sample amazing cuisine made onsite from up to 17 of the finest local and regional chefs/restaurants as you wander from booth to booth, including from Chef Laura Reyes from Roy’s Restaurant in Las Vegas. In addition to the culinary delights, guests can enjoy up to 12 wineries, beers from Deschutes Brewery and GoodLife Brewery and try unique cocktails from the spirits tent. The culinary expertise of our chefs will continually surprise your taste buds from one tent to the next. In between samples you can take in the amazing performances of two aerialists as they perform among our dinner guests and the top drumming street performer from New York City as well. Also visit the Silent Auction area to bid on a fun vacation package to Southern California, Palm Springs, Lake Tahoe, Portland, San Diego, Cabo San Lucas Mexico, Las Vegas and Hawaii. Corporate tables will be spread throughout the grounds in addition to bistro tables and other displays from local sponsors. The party kicks into another gear beginning at 7pm once the live dance band, Precious Byrd, hits the stage and plays well into the night. Precious Byrd features Grammy Award winning artist Lonnie Chapin and his band. When we say that this will be the party of the year, we truly mean it. The Dinner on the Range will be the biggest event of the summer and you won’t want to miss out. Does this sound good or what? Learn more about each component to the event above or get your tickets now and get ready to enjoy the event of the year at the 14th Annual Ghost Tree Invitational.